Why Are We So Fascinated by Obi-Wan Kenobi's Life on Tatooine? Obi-Wan prepares for a long life of obscurity in the climax of Revenge of the Sith. Somehow, an old wizard stuck for years in a lonesome hut on a forgotten desert world might be the most fascinating character in the Star Wars franchise. At least, you’d be forgiven for thinking so, given the books, comics, and TV shows dedicated to examining Obi-Wan’s lengthy time on Tatooine (and even now a potential movie, too). But what is it about this character, and this time in-between trilogies, that has lead Star Wars to revisit it time and time again? In both the old expanded universe and the current era of Disney’s all-consuming canon, the two-decade period between Revenge of the Sith and A New Hope charting the rise of the Empire has been fertile ground for storytelling. Especially so in Disney’s case, with books, comics, animated series, and now a whole saga of multiple spinoff movies so far being dedicated to the time period—on an unprecedented scale, in comparison to stories being told either in the gap between Return of the Jedi and the new sequel saga or even the ongoing stories set during the original trilogy itself. 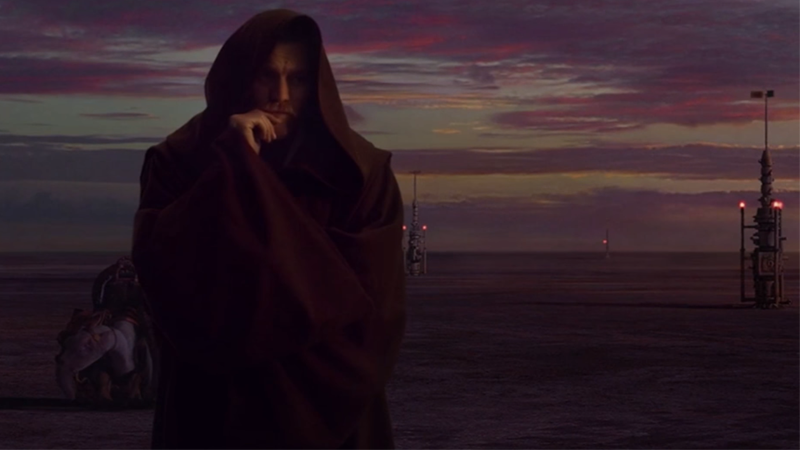 Obi-Wan pondering his need to stay hidden in the pages of Star Wars #7. But one story above all in that period has repeatedly been explored: just what Obi-Wan Kenobi was up to in his time on Tatooine, watching over the young boy that would one day herald the return of the Jedi. While the Expanded Universe would dedicate books and comics to charting the more introspective side of Obi-Wan’s journey from Jedi Knight to wizened hermit—and even zanier alternate-reality versions of it—it’s really been under Disney’s purview that Obi-Wan’s story has felt like it’s become more prominent. Marvel’s main Star Wars comic has dedicated multiple issues to side stories charting Obi-Wan’s fraught relationship with the Lars family, and the conflict of giving up a life of peacekeeping for the sake of secrecy. Then Obi-Wan became an important part of Darth Maul’s arc on Star Wars Rebels, giving us another bit of insight into what he was up to in the years before A New Hope. And then, of course, there’s one of the longest-running rumors around Star Wars moviedom—a will-they-won’t-they saga of a rumored Star Wars Story spinoff that would see Ewan McGregor return to the role and chart Obi-Wan’s self-imposed exile on the big screen for the first time. But why does it suddenly feel like Obi-Wan has become such an alluring vector for Star Wars media to explore? Part of it is down to the innate desire that drives so much of Star Wars fandom in the first place: the need to chart and organize and file raw knowledge about everything in the galaxy far, far away. Anyone who’s been on a Wookieepedia binge to read about Ickabel G’ont in the uncomfortably early hours of the morning can attest to the fact that Star Wars fandom craves the acquisition of knowledge—and given just how major a character Obi-Wan is to the series, details about a life unseen on screen offer a fascinating chance for insight, even if it is insight pretty narrowly restricted to Tatooine itself. The removal of old expanded universe material with Disney’s acquisition of Star Wars only served as a chance to re-tread that ground once more, offering a new take and, most importantly, new information. But even as the nascent Disney canon has given us more characters in this tumultuous period of Star Wars history that lived through and beyond it—like Ahsoka Tano, who from Clone Wars to the very end of Rebels has sneakily become one of Star Wars’ most-enduring and intriguing characters—Obi-Wan is still symbolic of this transitionary period between the trilogies than any other character, and for a good reason. The prequel and original trilogies literally clashing in Star Wars Rebels. Star Wars is divided by its trilogies, which are defined by their eras—the prequels, the originals, the sequels. And those eras themselves are defined by their radically different approaches to Star Wars, whether it’s visually or tonally. And as a veteran of the prequels and the original trilogy, Obi-Wan is one of the few tangible bridges between two very different eras of Star Wars. Much has been done to show the slow change from the aesthetic and world of the prequels to the muddy, “lived-in” Imperial dystopia we first witnessed in 1977, but Obi-Wan puts a personal face on that entire, fascinating change. He was there through it all, from the heights of the Old Republic, to the Clone Wars, and to the birth of his former best friend’s new Empire. To watch that transition unfold through a personal focal point—to see Obi-Wan become Old Ben—connects Star Wars’s disparate eras to each other far more strongly than simply putting episode numbers into the movie titles, or telling other stories in this ephemeral 20-year gap can. And other characters like Ahsoka can come along and tell similar stories and have their popularities flourish thanks to a similar connection. But Obi-Wan Kenobi will always be the first and strongest of those bridges between two wildly different sides of Star Wars—which is probably why we can’t help but be intrigued by the chance of seeing this chapter in his life unfold again and again.